Call me experimental..but I do love to collect brushes. So far I have 21 brushes in my collection. Most of them I bought online after watching beauty vloggers raved about them. Some were the result of impulse buying, that ended up as ‘misses’ brushes. Let me put it in a more simple way: I don’t like them all. So, which one are my faves? 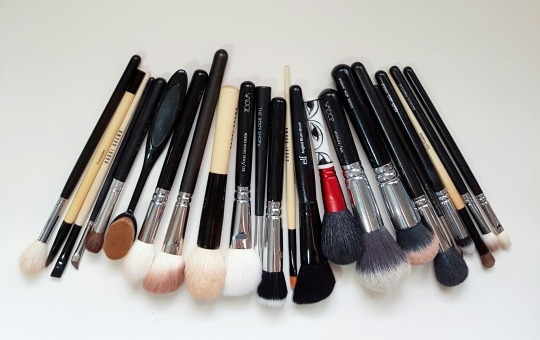 MAC168: this is a large angled contour brush, which of course I use it to contour. It picked up powder nicely without fall out and even though the bristles is white, it cleansed easily with the right brush soap. MAC217: I had this for ages until the logo faded away. I believe if cheaper brands made a dupe out of a brush, the original must be super awesome. And yup, this is my go to brush for blending eyeshadow on the outer area. MAC 09: even though this is a small contour brush, I use it to apply setting powder on my under eyes area. Good brush shall multi task! Coastal Scents Pro Blending Fluff: I bought this because it’s a dupe for MAC217 which apparently I already had. Why? Because I want to test the comparison. Not bad in performance, even though the bristles is more coarse than MAC, but hey..it’s so cheap so don’t complain. MORPHE M510: it’s a round blender for eyeshadow application. Some might find it’s too big for the eyelids alone, but I have wide eyelids, so it fits just fine. Sometimes, I use this for applying highlighter on upper cheeks too. 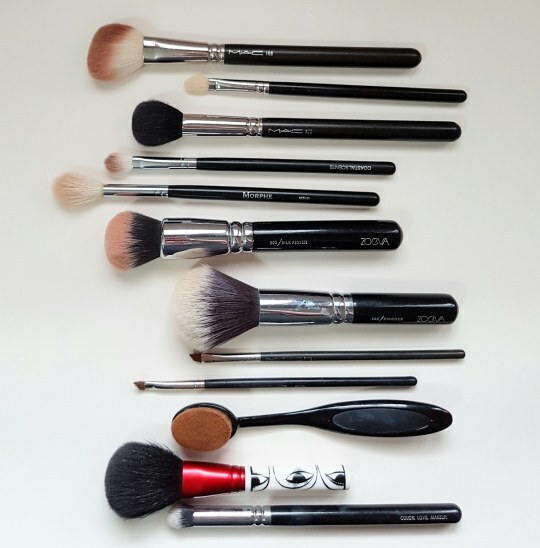 ZOEVA102: a vegan taklon foundation brush. Not a vegan myself, but I love this brush. I use this to blend liquid foundation as it won’t leave any weird strokes on my face. ZOEVA106: I bought this as a set with other Zoeva brushes on this list (Classic Set Brush), and this one also has vegan bristles. Super soft and big enough to dust loose powder all over my face. MAC266: my go to eyeliner brush, as I love gel eyeliner. This made application super easy, as I also love to do cat eyeliner. MAC208: I believe it is 208, as it’s so old…the logo already faded away. But the performance of the brush is still like the first time I used it. This is an eyebrow brush, I use it with brow powder. OVAL FOUNDATION BRUSH: this is a dupe of Artis oval foundation brush which costs like 10 times more. And of course this has no brand, costs only IDR 50K. Pretty dense bristles, I was skeptical when I first washed them as I was afraid all the bristles might fall off after the first wash. Turned out after hundreds of washes, it’s still look the same. So yeah…never judge the performance by its’ price. MAC Isabel & Ruben Toledo 129SE: I love limited edition, but living in Jakarta made it harder to get one. My husband bought this for me in Malaysia. Even though this is a powder/blush brush, I use this every day as a blush brush. The fluffy round bristles made the blush looks so natural..like glow from within. ZOEVA142: Last but not least, concealer buffer brush. A handcrafted brush which I use to apply concealer around the eyes. I rarely use it to cover acne or brown spots, as I prefer to use my finger to pat concealer on spots. TO CELEBRATE MY …. BIRTHDAY, I DID THIS!